Prices, promotions, specifications, availability and terms of offers may change without notice. Despite our best efforts, a small number of items may contain. Download ppt "Prices, promotions, specifications, availability and terms of offers may change without notice. Despite our best efforts, a small number of items may contain." Canon PIXMA MG B006AA RP: 57 Is a compact & stylish All-In-One. It offers fast and efficient high quality prints, copies & scans. With easy-to-use. InkJet and Thermal Printers. Inkjet Introduction InkJet Printing came about in the late 1980s InkJet Printing came about in the late 1980s Have become. Printer Types Laser – uses a big toner cartridge like a photocopier. High end on price, especially for color Ink Jet – spits out little ink dots on the. 2008-September PCC DSC OCS 2008-September PCC DSC OCS KX-MC6040KX-MC6020 KX-MC6260 Rev03. 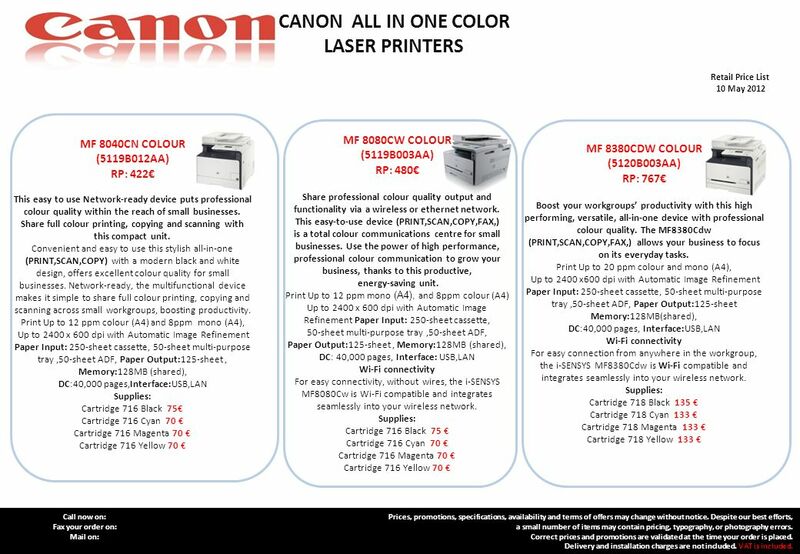 The essentials of imaging ©2002 MINOLTA-QMS, Inc. - Company Confidential PagePro 1250W Fast, affordable printing for small offices or home offices on a.
Konica Minolta 1600f Introduction. Exchange Meeting Jan 06 – Lars Moderow Have you ever heard that a MFP is compact, easy to handle and has a interesting. Canon i-SENSYS MF4450 Mono (4509B002AA) RP: 257 This stylish mono laser 4-in-1 offers print, copy, scan and fax functions in one compact device. Ideal. Brother E-learning Helping you to sell Sales Basics Part 1 of 3. KONICA MINOLTA PRINTING SOLUTIONS EUROPE B.V. The Powerful Personal Printer. 9050N Monochrome Laser Printer. 9050N Key Features & Positioning. HP is the world's largest IT company HP 650 Black Pages - € 10,96 HP 650 Color Pages - € 9,32 Supported Models: HP Deskjet Ink Advantage 2515. 1 No Frills Photo Enabled High Photo Enabled Medium Informed Price Conscious Micro-Biz Premium Home High definition photos that are beyond lab quality. -YOUR LOGO- HP NOTEBOOK PAVILION SLEEKBOOK 15 SERIES Retail File 09 January 2013 HP is World’s Largest IT Company HP NOTEBOOK PAVILION SLEEKBOOK 15 SERIES. MF6680dn Product Training 2 nd Half 2009 Name Month / Year.